The team at Sanvey Gate. 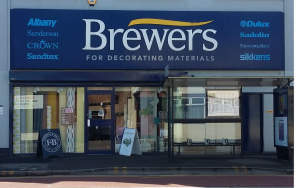 Our Leicester branch (one of two branches in Leicester) serves trade and retail customers from a wide catchment area, thanks to our excellent choice of brands and extensive array of wallpapers and paints. We also have a prime showroom with decorating accessories, clothing and equipment, paint mixing and wallpaper books for loan. 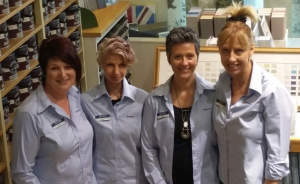 We’ve been an essential decorator supplier in Leicester city centre for more than 20 years now. Previously known as Stuart Decorating Supplies, we’re proud to have been part of the Brewers family for the past six years. Finding us is easy: Sanvey Gate is a minute’s drive off the A594 Vaughan Way. There’s dedicated customer parking at the rear of the building via Cumberland Street. Because we’re just behind the High Cross Shopping Centre car park, extra parking is always available. Our other Leicester based branch can be found in Freemen's Common. If using a satellite navigation system use postcode LE1 4QS to bring you to the car park. Exiting Craven Street, the store is visible across the road. From Northgate Street, turn left on to Sanvey Gate and the store is on the right.